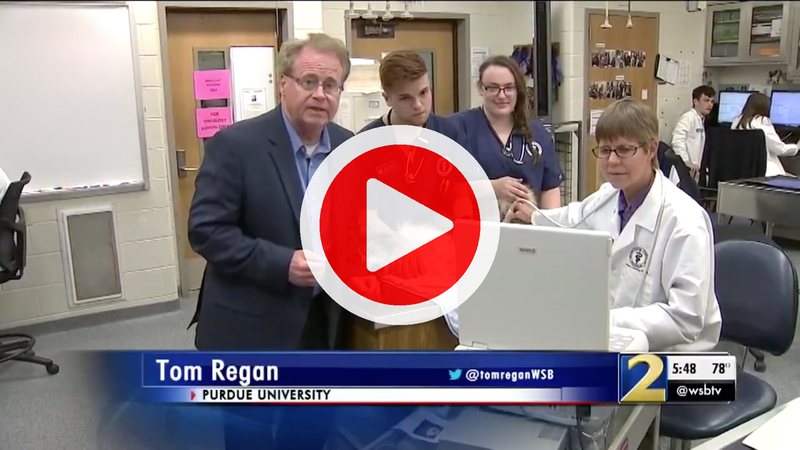 A news team from Atlanta’s WSB-TV, an ABC-affiliate TV station, visited the Purdue University Veterinary Teaching Hospital recently to report on the game-changing possibilities of clinical trials involving naturally occurring cancer in dogs. In the full video, Anchor/Reporter Tom Regan described research led by Dr. Deborah Knapp, Dolores L. McCall Professor of Comparative Oncology and director of the Purdue Comparative Oncology Program (PCOP). The story explained how comparative oncology research in dogs holds promise for speeding up the development of cancer-fighting drugs. Urinary bladder cancer, and specifically invasive transitional cell carcinoma or "TCC" or "InvTCC" in dogs, is an ongoing focus of research in the Purdue Comparative Oncology Program. Information learned from pet dogs with TCC is expected to help the individual dog, other dogs with the same type of cancer, and potentially humans with invasive bladder cancer. Two new treatment studies for dogs with TCC have recently started at Purdue (as of April, 2013). This study will begin September 1, 2014. For information, read this article by Dr. Marcia Dawson, Chairman of the Health Trust Fund (Scottish Terrier Club of America). Click here for an exciting update on our Scottish Terrier Screening Study. Support TCC Bladder Cancer Research with a gift or pledge to the Scottish Terrier Screening Study. Sue & Frank Severtsen and their Scottish Terrier, Pipsqueak, presented a generous donation to Dr. Debbie Knapp and the staff of the Purdue Comparative Oncology Program. We are thrilled to announce a most generous donation from the Scottish Terrier Club of Chicago Rescue group. Through the efforts primarily of Sue Severtsen and Caryl Alten, this group has raised over $22,000 which was presented to Dr. Knapp and her staff at the Purdue Comparative Oncology Program. This gift will be matched "dollar for dollar" and will go exclusively to the continuation of the Scottish Terrier Screening Study and to further Scottish Terrier bladder cancer studies. "Because of this generous donation, we are well on our way to funding the second year of this very important study," said Dr. Debbie Knapp, director of the Oncology Program and canine bladder cancer researcher for over 25 years. "We see that the Chicago Club has set a 'high bar' that other individuals and groups will be encouraged to follow". By attaching a toxin to an “epidermal growth factor (“EGF”), it is expected to enter cancer cells more readily via the EGF receptor of TCC and EGFR expression than normal cells and to be better able to kill the cancer cells. It is instilled directly into the bladder. Compensation: $100 per month. All treatments must be done at Purdue. A new targeted therapy to kill cancer cells that have a specific mutation is expected to be available for dogs in a clinical trial later this year. Work is ongoing on several fronts to gain a better understanding of how TCC forms, what makes it respond to therapy or not, and what makes it progress. Veterinarians at Purdue are working diligently in this field, and have also teamed up with multiple scientists on campus and across the country to do molecular analyses to address these critical questions. In order to accomplish this work, it would be extremely helpful to obtain samples of blood, urine, and tumor tissue from dogs with TCC, and to be allowed to perform necropsies on dogs with TCC if they are to be euthanized due to declining quality of life related to the cancer or other conditions. This applies to dogs who are already patients of the Purdue University Veterinary Teaching Hospital and to other dogs that have not yet been to the Teaching Hospital, but which have confirmed or presumptive TCC. Samples from dogs of any breed are very helpful. In addition to the work being done in dogs of any breed, dogs from breeds that have a higher risk of TCC (Scottish Terriers, West Highland White Terriers, Shetland Sheepdogs, Beagles) are also needed for a collaborative study with Dr. Elaine Ostrander at the National Institutes of Health. Work in these high risk breeds is defining underlying genetic factors that increase TCC risk, and that could lead to strategies to prevent TCC, or to find it earlier and treat it more effectively. Samples from dogs that already have TCC and samples from older dogs in high risk breeds that do not have cancer are needed. To learn more about the TCC studies or to set up an appointment, please call: Ms. Chris Royce, or Ms. Amalia de Gortari, at (765) 494-1130 or (765) 494-1107. Samples from high risk breed dogs can also be shipped directly to Dr. Ostrander's lab. We are currently recruiting dogs with multicentric lymphoma for multiple ongoing clinical studies. A Note on Prednisone: Please note that treatment of canine lymphoma with prednisone prior to initiation of multidrug chemotherapy has been associated with increased chemotherapeutic drug resistance and reduced remission and survival times. Therefore, dogs previously treated with prednisone are unfortunately not eligible for some of the ongoing trials. If you are a veterinarian interested in referring a canine patient with lymphoma to the Purdue University Veterinary Teaching Hospital (PUVTH) for treatment, please do not prescribe prednisone for that patient. We realize that lymphomas may progress rapidly and that prompt treatment is imperative for optimal patient care. We therefore make every effort to receive patients with a confirmed or tentative diagnosis of lymphoma as quickly as possible. Usually, appointments are available within 24-48 hours' notice. If you are a veterinarian interested in referring a canine patient with lymphoma for treatment, or if you would like additional information about these studies, please call the VTH at (765) 494-1107 and ask to speak with Ms. Sarah Lahrman, RVT, or Dr. Michael Childress. Diffuse large B-cell lymphoma (DLBCL), the most common type of lymphoma in dogs, is associated with varying degrees of clinical aggressiveness. The standard treatment for DLBCL, combination chemotherapy with cyclophosphamide, doxorubicin, vincristine, and prednisone (i.e. “CHOP”) affords cancer remission to 80-90% of affected dogs and significantly extends survival in most cases. However, some dogs with DLBCL derive little benefit from CHOP, a therapy that is expensive and may produce serious side effects in some dogs. Methods to accurately predict which dogs are and are not likely to benefit from CHOP are therefore desirable. We have recently shown that a novel tumor tissue imaging technology called biodynamic imaging (BDI) predicts the responsiveness of canine DLBCL to CHOP with approximately 84% accuracy. The purpose of this study will be to expand the use of BDI in a larger population of dogs with DLBCL to more fully define its predictive capability. Tissue biopsy samples will be collected from all dogs in this study prior to administering chemotherapy and at the time that their cancer first relapses after receiving chemotherapy. These biopsy samples will be analyzed using BDI in order to develop a more complete understanding of the ability of this technology to predict the response of DLBCL in dogs to CHOP chemotherapy. The cost of initial tumor biopsy is discounted by $250. The cost of tumor biopsy at the time of cancer relapse is fully covered by the study. CHOP chemotherapy is provided at a discounted rate to dogs enrolled in this study. Immune therapies are emerging as a highly effective treatment option for some cancers. The most effective immune therapies frequently target a molecule that is present in large amounts in cancer cells, but rarely present in normal cells in the body. In several cancers, one such promising target molecule is the folate receptor (FR). We have previously shown that the FR is expressed in about 75% of cases of diffuse large B-cell lymphoma (DLBCL) in dogs. The FR is also expressed at high levels in human osteosarcoma, making it plausible that canine osteosarcoma also could also express this molecule. In this pilot study, we are determining whether a new drug called EC17 is taken up by tumors expressing the FR. We are also investigating whether a diagnostic imaging procedure (“folate scan”) can help us to determine which dogs’ tumors will take up EC17. All dogs in this study will undergo a folate scan on the first day of the study. The following day, dogs will receive an intravenous dose of EC17, after which they will undergo either surgical lymph node biopsy (DLBCL) or amputation of a tumor-affected limb (osteosarcoma). The results of this study will help us to develop future studies in which EC17 is given as part of an immune therapy to treat cancer. Specifically, these trials will involve training the immune system to recognize and destroy cancer cells to which EC17 is bound. Epitheliotropic cutaneous T-cell lymphoma (ETCL) in dogs is a skin cancer for which few effective therapies exist. The chemotherapy drug gemcitabine is commonly used to treat humans with this cancer. Although gemcitabine has been shown to be well-tolerated in dogs, its use as a treatment for dogs with ETCL has not been described. In this clinical trial, we will enroll 10 dogs with ETCL to test the efficacy of gemcitabine against this cancer. In addition, we will test the ability of a novel tissue imaging technology, biodynamic imaging (BDI), to predict the responsiveness of ETCL to gemcitabine. We have shown in previous studies BDI predicts the response of primary nodal lymphomas in dogs to chemotherapy with approximately 80-90% accuracy. This will be the first time that BDI is used to predict the response of canine ETCL to a chemotherapy drug. All dogs enrolled in this study will undergo biopsy of one or more skin tumors at the time of trial entry to provide tissue for BDI. All dogs will then receive 6 gemcitabine infusions over a period of 8 weeks while participating in this study. Dogs with any stage of disease are eligible. However, dogs must have at least 2 grossly apparent ETCL lesions, one of which must be suitable for biopsy to provide tissue for BDI. No chemotherapy or radiotherapy in the past 2 weeks. Dogs must not have received any corticosteroids for at least 7 days prior to study enrollment. Pet owners will be responsible for $100 towards the cost of initial office visit and clinical evaluation to determine their dog’s eligibility for participation in the study (normal cost approximately $450). Pet owners will be responsible for $25 for each gemcitabine treatment given to their dog while it is enrolled in the study, up to a maximum of 6 treatments (normal cost approximately $200 per treatment). Soft tissue sarcomas in dogs represent a diverse group of tumors with similar clinical characteristics (locally invasive growth, rare metastasis). Surgical removal is the treatment of choice for soft tissue sarcoma, but is sometimes not possible due to their invasive growth. Palliative radiation therapy is useful for temporarily controlling the growth of soft tissue sarcomas, but it cannot provide durable cures of these cancers. In this study, we will be investigating how well a new calcium tungstate nanoparticle therapy developed by scientists at Purdue works to sensitize soft tissue sarcomas to radiation treatment. This treatment may hold great promise for improving the effectiveness of radiation therapy to treat soft tissue sarcomas in dogs in the future. Serious concurrent illness (e.g. heart or lung disease, bleeding tendency) that would prevent general anesthesia or repeated tumor biopsy. Radiation therapy may cause side effects in the skin overlying the tumor similar to a hot spot or rash. These are called acute side effects and are usually mild and self-limiting. If acute side effects occur at all they will resolve. In traditional palliative radiation therapy the frequency of acute side effects is about 1 in 10 cases. The addition of the nanoparticle treatment to the radiation therapy protocol may make these side effects occur more frequently or more intensely, but they are still expected to be self-resolving. Acute side effects are managed with pain medications and topical medications to ease discomfort. By participating in this study your dog may incur benefit over and above what is expected from palliative radiation therapy. You will also be helping us to investigate new treatments for cancer in dogs and humans. All dogs in this study will receive once-daily radiation treatments for 5 consecutive days (M-F). Each dog will receive an injection of the nanoparticle treatment directly into its tumor immediately prior to the first radiation treatment. The dogs will also undergo 3 computed tomography (CT or “CAT”) scans, which will help to plan the radiation treatments and will provide a measure of how much the tumors shrink in response to radiation treatment. Three small tumor tissue biopsy samples will be collected from each dog’s tumor at different time points during the course of treatment. Piroxicam is a non-steroidal anti-inflammatory drug (NSAID) commonly prescribed as a treatment for dogs with cancers. It has been shown to produce measurable tumor regression in dogs with bladder cancer (transitional cell carcinoma), squamous cell carcinoma, mammary cancer, and other cancer types. However, piroxicam also may cause gastrointestinal side effects, such as vomiting, diarrhea, or loss of appetite, in some dogs. Drugs to protect the gastrointestinal tract (i.e. gastroprotectant drugs) are often prescribed in an attempt to limit these side effects of piroxicam. However, it is not clear whether these drugs actually have a protective effect in this setting. In fact, some evidence suggests that gastroprotectant drugs may unexpectedly increase the risk of piroxicam-related gastrointestinal side effects in cancer-bearing dogs. This clinical trial will more clearly define the influence of gastroprotectant medications on the side effects of piroxicam. Dogs in this trial will be randomly assigned to treatment with piroxicam alone, or piroxicam plus one of two gastroprotectant medications – omeprazole (Prilosec) or famotidine (Pepcid AC). The rate of gastrointestinal side effects in these three groups of dogs will be evaluated over a 3-month treatment period. This study is open to all dogs with a histopathologically-confirmed cancer. Evidence of liver dysfunction (increased bilirubin, ALT, ALP). Prior history of side effects after receiving other NSAID drugs (e.g. Deramaxx, Previcoxx, Rimadyl, Metacam, aspirin). Signs of gastrointestinal disease (e.g. vomiting, diarrhea, loss of appetite, weight loss, blood in stools) at the time of study entry. Pet owners will receive a financial incentive of $65 per monthly visit while their dog is participating in this trial. This will cover the cost of piroxicam therapy for each dog. Office visit fees will be waived for dogs participating in this study, and the cost of laboratory diagnostic tests (e.g. blood tests, urinalysis) will be discounted by 15%.